It is the stuff of horror movies. 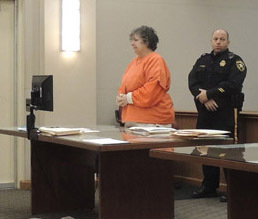 Loretta Doyle Burroughs, a 63-year-old grandmother, is accused of killing her husband and packing his remains into two plastic containers, which she brought with her when she moved at least twice over seven years. Donna Andersen got an exclusive interview with the victim’s brother, Ray Wantorcik, which was published by Mail Online. EXCLUSIVE: ‘She stabbed him to death and kept his chopped up remains in plastic containers for 7 years, enjoying her life.’ Brother of victim whose wife is charged with murder reveals she dragged the remains along each time she moved, on Dailymail.co.uk. Thanks Redwald! There is much more to the story, which will come out during the trial. This woman would likely score really high on the PCL-R. Her previous husband also died mysteriously back in 19993, although police say the don’t have enough evidence to re-open the case. OMG – this woman sounds like a true sociopath. She put on a good act of crying in court. I wonder how many spaths do stuff like this and get away with it; they never get caught….